For years, finding munchies for our pets has been a perilous task. One of your pets may be vegetarian, while the others love meat. One might prefer salty and the other sweet. How are you to know what they’ll like, and what they’ll hate? And how is it possible to do all of that within your budget? Fear not! Neopia’s greatest chefs and food critics have assembled to take on the ultimate task: tasting the food of and rating every single food store in Neopia. This guide will provide you with everything you need to know on Neopia’s food stores! 1: Disgusting. It’s absolutely revolting and inedible! 2: Pretty gross. It’s “meh” at best and “ew” at worst. 3: Mediocre. It’s edible and okay, but not the greatest. 4: Pretty good! It’s tasty food that you'll enjoy eating. 5: Amazing! The food is EXCELLENT! While on the more expensive side, it has a delicious array of authentic Altadorian food. The only downside is the lack of variety- the food here seems to consist of hummus, olives, and figs. These, though delicious, get old after a while. Even so, head to Exquisite Ambrosia for a certainly exquisite meal! This is a small shop on the outskirts of Brightvale, where fruits gathered by the locals are sold. The fruits, on the most part, vary completely. While certain fruits like the Icky Fruit and the Grenanna throw us off, the overall tastes of the fruits and price range of the store make it a decent place for everyone to buy fruit. The food in Faerieland is certainly very sweet, that's for sure. The prices here can get quite high- possibly even too high for the quality of the food, which is sugary and unsatisfying. However, when faced with eating something wholesome and eating a Faerie Bubble, who's to say we'd eat healthy? This is the place for indulging every now and then. Why would anyone come here- even on Halloween? Spooky Food is definitely spooky. That's a bad thing. Who would want to risk eating an Octornapie? They taste awful, and aren't exactly cooked, either. Don't even get us started on the Sun Dried Techo Claw. Even though the prices are excellent, we can't recommend this place. One word: DISGUSTING! If only the prices were a bit lower, this would be the PERFECT place to get a meal! 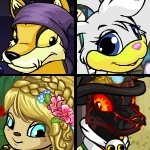 The shady site of Neovia is home to the Crumpetmonger, which is why so few Neopets know of it. The food here is excellent, consisting of baked goods. Whether you're in the mood for sugary or savory, you're bound to find something yummy here! Prices run high at Kiko Lake, mostly because of those clever Kikos wanting to take advantage of tourists. Despite this, the food we sampled was delicious. Though there is a low variety- mostly lollies- at this store, there was clearly enough Kiko Lake charm to bring us back for more. Only come here if you've got enough Neopoints to spare; otherwise, you're better off getting lollies somewhere else. The atmosphere of Cafe Kreludor is a little strange, and not just because it's on the moon. Most days, you'll find lots of orange Grundos around, munching on the mediocre food and complaining about how awful Virtupets Space Station is. We have suspicions that the baker put more effort into disgracing Grundos Cafe than he did into the food. Some dishes are all right, while others are downright tasteless. Is this really better than Grundos? For a place that doesn't exist, Jelly Foods is surprisingly good. For a food store, however, Jelly Foods will disappoint. There is little to no variety at all- just different-colored jellies molded into different shapes. The prices aren't too bad, but why would you want to spend money here when you can just eat the buildings outside? Kelp: hit or miss? Though the food is beyond compare (absolutely delicious!) the prices are also beyond compare. They are EXORBITANT. No normal Neopian would be able to afford a single meal at Kelp without taking a significant chunk out of their wallet. If we didn't have to pay, Kelp would be a foodie's heaven: everything on the menu is scrumptious! Unfortunately, we do have to pay, so decide whether it's worth it before coming. Um, ew? We understand that Merifoods sells authentic Meridellian food, and that Meridell has never been a very rich land, but that doesn't quite make up for what we've been through here. Who in their right mind would come here to eat Mouldy Potatoes or Stinky Cheese? And who'd pay over a thousand Neopoints for a Smooshed Tomato? This is a place for the citizens of Meridell alone, who will appreciate and enjoy it. Fiery flavors are abounding in Molten Morsels! This is not the place for someone who prefers mild-spiced foods. Everything here, and in the surrounding city of Moltara, is hot. That means all of the food here, albeit delicious, can be a little too spicy for your tastes. Some of them are hits, but some of them *cough* Rock Waffle *cough* are spicy and... rocky. Head here if you’re in the mood to fire up your taste buds! If you’re looking for ripe, refreshing fruits, look no further. This place, located on Mystery Island, sells the native fruits. The variety runs high, but sometimes creativity runs a little low. While we can’t really judge the fruits, homemade foods like Squirming Salad and Azzle Sauce probably won’t appeal to non-islanders. Despite this, the fruits never get old, because the flavors here are always changing. Literally! Can you get any more old-fashioned than Neopian Fresh Foods? That’s not necessarily a bad thing, though. When you’re sick of eating crazy fruits and high-end fusion dishes, this cozy little store in Neopia Central can bring back the good ol’ days with its delicious comfort food. All the old favorites are made here. When you need a little pick-me-up in the morning... or in the afternoon... or in the evening... or as a midnight snack... well, anytime, really... the Coffee Cave, also known as the Ye Olde Coffee Shop, is the perfect spot. The coffees here are delicious on the whole, and the variety is excellent. It’s a good thing so few Neopets have heard of the Deep Catacombs! Hot dogs are good, especially the way Hubert makes them. But are they really delicious? Maybe not- they’re just meat in a bun. Hubert tries to get a little creative with his franks. Unfortunately, this isn’t the creative we’re going for. Cucumber Hot Dog? Hot Dog Split? FRUIT STUFFED JACKET POTATO?! Ew! We came here for HOT DOGS, remember? Smoothies, smoothies, smoothies. They’re good when they’re in their natural forms- fruit! What happened to our strawberry and blueberry smoothies? They’ve been replaced by Bean and Shepherd’s Pie Smoothies. This makes us want to cry, but instead of crying we’re going to lower the rating. Ha ha, little Tuskaninny, that’s what you get for trying to serve us Salmon Sherbet Smoothies! Hmrph. Fine, we’re food critics, but we’re Neopians too. And we like ice cream just as much as you do. So why in the world would we enjoy eating Organic Chia Wort Roots with a glass of Tomato Basil Juice? This place is a hit with our vegetarian friends. Unfortunately, we don’t like all of the seaweed and organic action going on around here. This is Cybunny food! PizzaROO! We love the chef here. He’s, like, our food IDOL. All right, we’re sorry about how weird we’re acting... we just LOVE Pizzaroo, as does any ordinary Neopian! The pizza here is delicious, even when it has no special ingredients in it... and when it does, it’s FANTASTIC! Gooey melted cheese, warm pepperoni, chewy veggies... mmm. Mmm, authentic dishes from the heart of Shenkuu! The food has a different kind of feel than your usual fare, mostly because of the excellent chef and all-natural ingredients. Though some might be turned off because of how these dishes aren’t your mainstream, typical meals, we like how the chef didn’t take the easy path to success. Calling all curry lovers! If you’re sick, come here. But if you’re perfectly healthy and have just suffered from a two-day trip with nothing to eat but Dried Apricots, this is NOT a good time to come to Remarkable Restoratives. One of us was sick and had to eat a few Dried Black Mushrooms, so we all joined him. While he enjoyed it completely and had an immediate recovery, we just felt sick to our stomachs. And to our wallets! This small, cozy place off to one side of Happy Valley isn’t exactly what you’d expect to find in a snowy wonderland. Slushies in the snow? Well, we suppose that’s where they get their fresh ingredients. We completely love these delicious cold blends of our favorites. Except for the STONE AND LIME SLUSHIE. Um... no. The name is a mouthful, and so are the treats they sell here. After being ushered in by a hyperactive Lenny, we were immediately offered Snow Puffs and Brucicles. They weren’t exactly what we wanted after climbing all the way up the mountain, but they were delicious nevertheless. Come here if you’re in the mood for something cold! Is this really what the residents of Sakhmet eat? We think not! Most of the food sold here consists of sand. Sand. If you want to eat sand, don’t bother with this store; just eat the ground outside. Now, for the true question: what do the natives eat? Not to be judgmental, but why does Sakhmet’s food taste so bad and Qasala’s so good? Is it because Qasala is farther south? (Okay, even we admit that doesn’t make any sense.) Even though there is little variety here, the dishes consisting of mostly Qando and Queela, they are tasty nevertheless. Authentic Qasalan meals at their finest! Upon entering the store and seeing the wares, we all had the immediate urge to leave. Still, our foodie duties kept us inside. We know that this food is extremely authentic and all of the natives come here to eat. What we don’t know is if those Poogle Steak Leftovers really were made of Poogles. Does anyone know what “ugga-ugg a-ugga Poogle uggh” means? Out of this world, or galactic failure? We’re just going to go with “meh”. Yes, we have all of our space-station favorites here, including the world-famous Roast Gargapple- how does Gargarox get the sugar coating to taste so good? –but there’s nothing new. After all of those light-years, our favorite Grundo chef couldn’t do better than Deep-Fried Space Rocks? So there you have it, folks! An in-depth guide that covers every single food store in Neopia. We hope that this guide helped. And we also hope that, one day, we will eventually lose the 130 pounds we gained while on this trip. Everything I once knew was lost and I had no idea where it went or why this happened. Why was I the only one left? Some jelly should be relabeled Gross Food. "Fate always finds a way, Saeryennan of Altador."